The Ohlange Institute was founded by John Langalibalele Dube in 1900. Dube was a founder member and first president of the South African Native National Congress (SANNC) which was renamed as the African National Congress (ANC) in 1923. The idea of the school was conceived when Dube returned to the United States of America (USA) in 1897 for further training. Upon arrival he enrolled at the Union Missionary Seminary in Brooklyn, in New York and in March 1899, Dube was ordained as a priest by the Congregational Church. During this visit Dube was profoundly influenced by Booker T Washington, an African American educator who propagated of self reliance. Washington’s ideas dominated Dube’s educational and political thoughts. Both Dube and Washington were inspired by the motto ‘learning and labour’, which Oberlin College had adopted. Both men were considered civil rights activists, educators and writers. Washington encouraged his students at Tuskegee to become self-reliant by teaching them skills such as printing, farming, shoemaking, and cooking, amongst others. Dube increasingly saw education as a means for Black social and economic advancement. This inspired him to develop a similar kind of initiative aimed at advancing the rights of Black people in South Africa. Upon his return, Dube established the Zulu Christian Industrial Institute on 8 August 1900. The land on which the school was built was donated to Dube by Chief Mqhawe of the AmaQadi. The institute became the first Black-directed institution and emulated Washington’s Tuskegee Institute. On its launch acollection of funds $275.00 was raised. A small group of Whites, including, George Hodson, American Board ministers, SC Pixley, CW Kilbon, Mr Pugh and William Cullen Wilcox, the missionary who had first taken Dube to the United States of America in 1887. On 20 August 1900 the school opened with 63 male students, half of whom lived on the campus. Within three weeks the school had close to 100 pupils. The institute was renamed the Ohlange Institute in 1901. 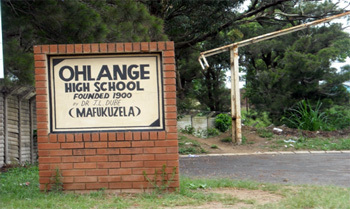 Ohlange functioned as a school where African children obtained education. For the first few years of it existence the institute was supported by the American Board of Missions. In addition, students paid tuitionof $12.00 for a term of four and a half months. At first the school had only four instructors: Dube, his wife Nokutela, Pipile Msweli and John Mdima. One of the funders, Pastor Robert J Kent, agreed to discuss Dube's appeal for funds with sympathetic members of his church. A number of the members of the local congregation agreed to help raise money for the establishment of a Christian Industrial School for the benefit of Zulus. Gandhi and Dube were neighbours for a period of time. Dube lived at Ohlange from the turn of the century, while Gandhi founded his first ashram at Phoenix, in the valley directly below Ohlange, in 1903. Gandhi lived there until 1913. Gandhi and Dube shared similar ideologies – determined to achieve equality for their respective communities in a peaceful manner – and both were involved in publishing newspapers. It is reported that Gandhi often visited Dube and engaged in discussions about their ideologies. The school subscribed to the stern social Darwinist concept of ‘survival of the fittest’. Dube stressed to his students that they ‘honour the man who works’ and he was convinced of the ‘demise the idler’. Through the institution, he sought to create a class of independent and educated entrepreneurs who would represent the political and economic ideas of a specific class of Blacks in South Africa. This class was to be an educated, self-sufficient ‘kholwa’ elite – the word ‘kholwa’ was coined to refer to an African Christian bourgeoisie. Local white officials were sceptical of Dube's motives, but the reputation of the school spread far and wide and by 1910 he succeeded in getting the support of a substantial group of influential whites. Upper class sectors such as the educated and affluent kholwa, the missionaries, influential sugar planters and liberal white politicians publicly supported Dube’s institution, claiming it played a reforming and constructive function. The first four years of Ohlange's operations were the most difficult. The students' tuition fees was not enough to pay for the teachers’ salaries and Dube's salary as pastor from Inanda Congregation Church was scarcely enough for his family's needs. The school's intake increased to 103 boys who boarded at the school and 56 day scholars. By the end of 1902, 118 boarding pupils and 111 day scholars attended the school. To make room for more students, some scholars slept on mats on the school’s floors, while others slept on the floors of two unfinished buildings. Fortunately, in 1905, American Committee member Emaroy June Smith donated thousands of dollars to allow Ohlange to construct a men's dormitory. New instructors included Thomas Koza, an African educated at St Albans College in Pietermaritzburg; Mrs Reynolds L Scott (Scott's African bride), who obtained her education at Inanda Seminary; and Inanda graduate Mrs D Dludla. All seven teachers taught English, Mathematics, General Science and Industrial Work. By 1914, the school had 220 pupils. They paid £6.00 to attend classes for the nine month school year, although they were required to work on the premises for three hours every day. By now the staff of Ohlange consisted of Adelaide Dube (wife of Charles Dube - John Dube's brother) who served as the standard seven teacher; Robert Fredericks, standard six teacher; K Blackburn, Commercial training and Bible classes; David Opperman, standard five teacher; Merian Opperman, standard four teacher; Nikani Ngcobo, standard five teacher; J Cele, standard four teacher; L Mtembu, standard three teacher; and M Mapumulo, standard two teacher. The Industrial Education Department was made up of: J Mchunu (Carpentry), J Nswelling (Shoemaking and Leatherwork), V Mootho and C Tshabalala (who directed the printing shop and trained students to work on the Institute’s newspaper), W Dimba (Agriculture), J Mseluku (Masonry and Building) and K Kanoo (Blacksmithing). Nokuteela Dube instructed classes in music and assisted her husband in running the school. Charles Dube served as teacher and headmaster. In 1917 a girls' dormitory was opened at Ohlange and the school initiated a teacher-training course primarily for women. By 1918 Ohlange was the first to offer the Cape Junior curriculum, later called the Junior Certificate course. In 1924, Charles T Loram, Superintendent of Education, asked William Wells, a White teacher, to take up the position of headmaster at Ohlange. The Natal Education Department recognised Ohlange for the purposes of financial assistance and began to subsidise teachers' salaries. On 24 February of the same year, the new Ohlange Institute Trust was empowered to direct the management and conduct of the school. In 1926, a tailoring course was introduced. By 1929 Ohlange students took Humanities and Social Science courses which prepared them for the Junior Certificate examination of the University of South Africa. The course could also serve as an entrance qualification for the University College of Fort Hare. Students studied for three years after reaching the standard six level. In 1930, the Zulu choir of the Ohlange Training Institute, Phoenix, Natal, under the conductorship of Mr RT Caluza, a teacher at Ohlange, visited Great Britain for the purpose of making phonographic records for His Master's Voice Gramophone Company. The choir of 10 members also sang to large audiences in public halls. In 1950 the 'Mafukuzela Day' was instituted at Ohlange. In time, this became 'Mafukuzela Week' with figures such as the Zulu king in attendance. The imposition of apartheid had a negative impact on the school. In 1953 the government passed the Bantu Education Act which had a negative impact on Ohlange School resulting in its decline. When apartheid eventually collapsed and the first democratic elections were held in 1994, Nelson Mandela chose to cast his vote at Ohlange. • Hughes, H, (2011), First president: the life of John Dube, founding president of the ANC, (Sunnyside: Jacana Media), p.312. • Shula, M (1986), The ambiguities of dependence in South Africa: class, nationalism, and the State in the twentieth-century Natal, (John Hopkins University Press), pp 41-73. • Welsh,D, (1971). ‘Missionaries after Shepstone’ in The roots of segregation: native policy in colonial Natal, 1845-1910, pp 270-311. • Giliomee, H & Mbenga, B., (2007), New history of South Africa, Cape Town, p169. • Switzer, Les (ed. )., (1996), South Africa’s alternative press: voices of protest and resistance, 1880s-1960s, (Cambridge University Press), pp.83-98.